What is your TMJ? Your TMJ or temporomandibular joint is your jaw joint. You have a jaw joint on each side of your face just in front of your ear. They are the joints that attach your bottom jaw to the rest of your skull. You can actually feel the joint working when you put your fingers in front of your ears and open and close your mouth. The fact is, your TMJ is a pretty complicated joint. Take the quiz below to find out about the parts of your TMJ. True or False: Your TMJ is a bit more complicated than the other joints in your body. True or False: Each side of your lower jawbone has a thick round end. True or False: Your TMJ also consists of something called an articular disc. True or False: TMJ disorders can cause various symptoms. True: Your TMJ is not constructed exactly the same as your other joints, but it can still become strained, sore, or damaged. 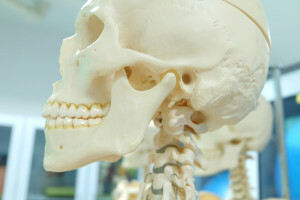 True: The bone on each side of your lower jaw is thick and rounded at the end so each bone fits into the indentation on each side of your skull. True: The articular disc is a structure made of cartilage and shaped like a disc. It is located between the lower jawbone and the skull bone. Its purpose is to help provide a smooth action by keeping the two bones from rubbing together. True: TMJ disorders can cause various symptoms including head, neck, shoulder, and back pain. This is due to strain or inflammation of the ligaments or muscles surrounding and/or connected to the TMJ. Pain caused by the muscles, joint, or ligaments can cause pain in the jaw and face, and/or travel to the head, neck, shoulders, and back.